Perhaps the number one reason for owning a dog is to enjoy the unbridled affection they lavish on their family. After a long, stressful day it’s remarkably energizing to come home to a beloved pet that’s clearly overjoyed to see you. However, it’s possible to have too much of a good thing. When your dog greets you with love, that’s great, you’re clearly doing an excellent job making your dog feel loved in return. But when that greeting becomes overly rambunctious and jumping is involved, it becomes a problem. Left unchecked, this behavior can make those wonderful reunions something you actually dread, and no one wants that. 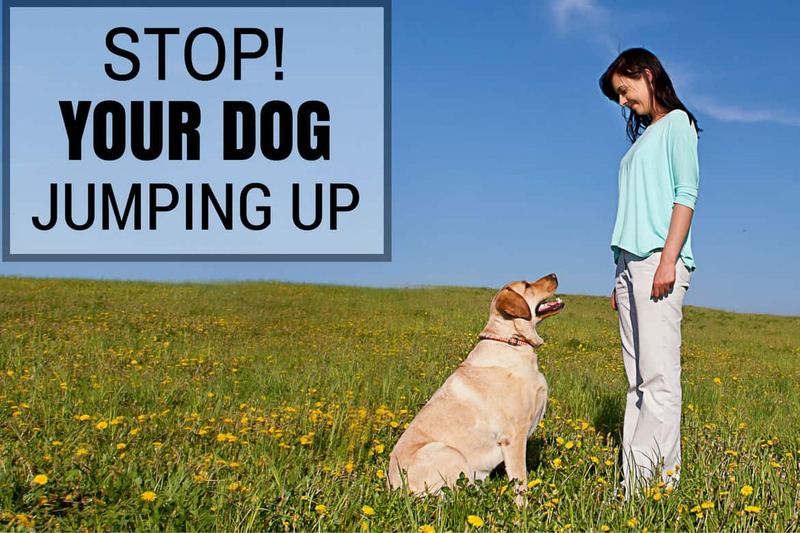 In this article you’ll find tips, tricks, and resources that show you how to stop a dog from jumping up and help to keep your dog grounded. Why Does My Dog Jump Up When He Says Hello? Is There More to Jumping Than Just Excitement? Before we can correct a behavior, it’s important we first seek to understand it. We need to know why it happens to effectively prevent it from happening again. Fortunately, as behaviors go, jumping is a relatively simple one to comprehend. In the case of a dog jumping, it’s most likely a result of being a social animal. No doubt you’ve noticed that when dogs greet one another, there‘s a whole lot of sniffing going on. Apart from the unintentionally comedic inspection of the private areas, dogs also frequently smell and lick each other’s muzzles. 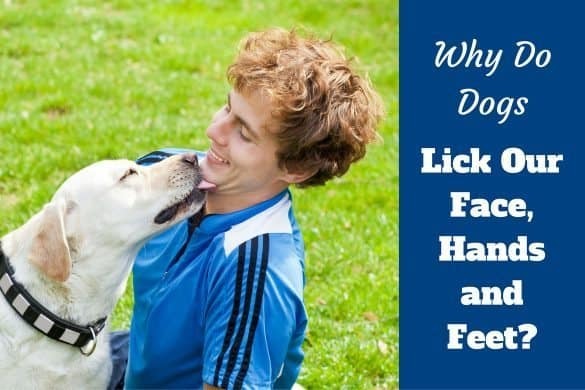 That’s because a great variety of smells emanate from these parts of the body, and dogs learn a lot by smelling. With most dogs being relatively close in height, this can be accomplished without a lot of hoopla. But when they’re trying to say hello to a human, well, it can be a long way from the ground to a person’s face! What you’re seeing is a perfectly natural canine behavior adapted to accommodate their far taller bipedal family and friends. And if you own one of the more exuberant breeds (which you likely do, if you’re at this site), or almost any puppy or younger dog, they’re even more likely to engage in this behavior. In contrast, my 12 year-old German Shepherd has zero interest in jumping on people coming through the door, no matter how much she likes them. 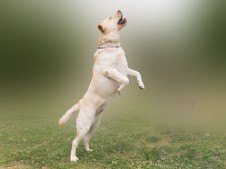 A jumping dog can cause annoyance, and even injury when you’re dealing with a large breed like a Lab. A jumping puppy is cute, but a dog that weighs 60 or more pounds is a force to be reckoned with. Small children and the elderly will be no match for a big friendly dog flying through the air. You also don’t want your dog jumping up on someone who is actually afraid of dogs. For everyone’s comfort and safety, this is a behavior that needs to be corrected. There is almost never any underlying medical or physiological issue involved with jumping to say hello. 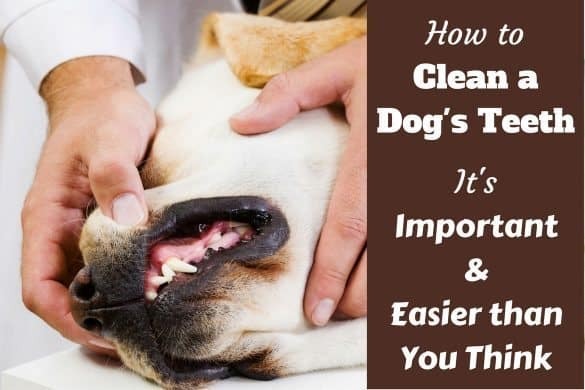 At worst, you might have a dog that learned this behavior with a previous owner, or perhaps your dog isn’t getting enough exercise and has some extra steam it needs to blow off. Of course, there is always a chance that your dog is feeling anxious, or insecure, and is looking to you for reassurance and a safe embrace. A puppy will likely grow out of this behavior, but if you have an older dog showing these tendencies, there may be a more serious underlying problem. Jumping up is practically unique among unwanted behaviors in that it is frequently rewarded, especially when the dog is young. A playful puppy jumping on your leg is undeniably adorable, and any dog lover’s natural inclination is to pet and play with said puppy. Though we may not realize it, attention is a reward, and once a behavior is rewarded, it becomes routine. Further compounding the problem, rewards for this behavior are regularly doled out by well-intentioned visitors to your home and even complete strangers on the sidewalk, or at the park. So, even if you as an owner are doing nothing to encourage your dog to jump, it may become a problem anyway. Essentially, your dog has become a victim of its own cuteness! If attention is a reward, then inattention is the obvious deterrent. I’m not saying to ignore the problem and it’ll go away. 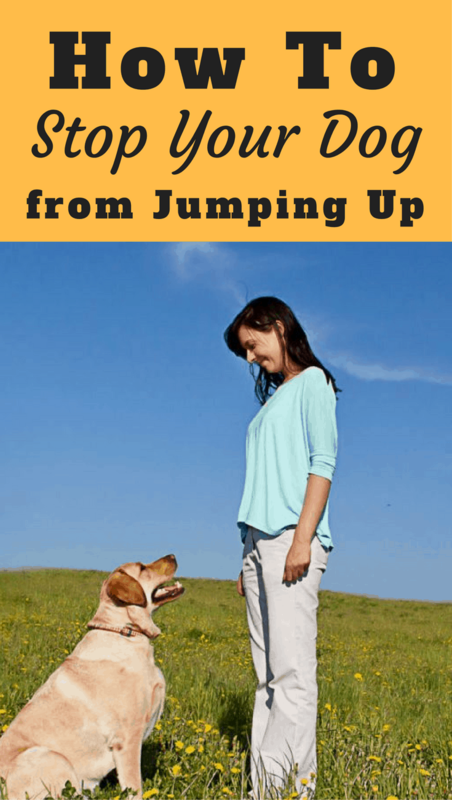 But the key to discouraging jumping is to take away the reward your dog is seeking for the behavior. Your dog is perpetually seeking your approval, and if it doesn’t get it, it soon learns to stop doing those things that don’t elicit a favorable response. When your dog jumps up at you, the best response is to simply turn away from it. Additionally, you should avoid any eye contact with your dog. Myself, I also bring my hands up to my chest; many dogs will try to rub their heads on your hands in order to make it very clear what they want. By removing your hands from the equation, you take away the opportunity for your dog to do this. Your dog is quite clever, and will likely stop trying to jump when they receive no response. As soon as they have all four paws on the ground, go ahead and give them a calm and friendly greeting. If the jumping immediately resumes, turn away again until they stop. Again, when they are fully ‘four on the floor’, offer gentle praise and affection. Though you may wish to praise your dog with greater enthusiasm, refrain from doing so as it will just encourage them to get excited all over again. If your dog is already familiar with the ‘sit’ command, you can incorporate this into your technique. Rather than turning away from your dog, back off and give the command including any hand gesture you might use. It stands to reason that your dog can’t jump and sit at the same time, so given the chance to do what it’s been asked, your dog will probably choose to do what it already knows will please you. Again, offer calm praise and a greeting when four feet and a backside are on the floor. Other commands can be substituted for ‘sit’ if you prefer, such as ‘stay’ or ‘down.’ However, if your dog simply gets too excited to execute these commands properly (as is often the case, especially with puppies) try diverting their attention elsewhere. Ask them to go find their ball, or a favorite toy, as a way to distract them and expend some energy. And, as always, reward the good behavior with praise. 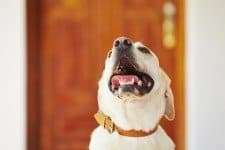 Another way to teach your dog that sitting or standing is the best way to say hello is to use your door as a tool. If when you cross the threshold your dog moves to jump at you, step back out of the house or room, and close the door. Wait a moment for your dog to calm down, and then try again. You may need to do this repeatedly, but eventually your dog will catch on to the fact that you won’t come through the door if he’s jumping. When you open the door to find him nicely sitting or standing, come in and offer him the praise he deserves, and perhaps a treat. A note about treats: They make for excellent rewards, especially with food-driven dogs like Labradors. But, if you’re not careful, your dog may learn that it gets a treat for jumping and THEN sitting. Use treats sparingly. 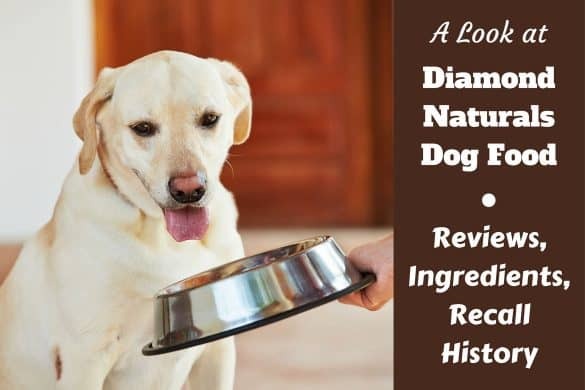 By mixing up your dog’s rewards (treats, toys, praise, etc. 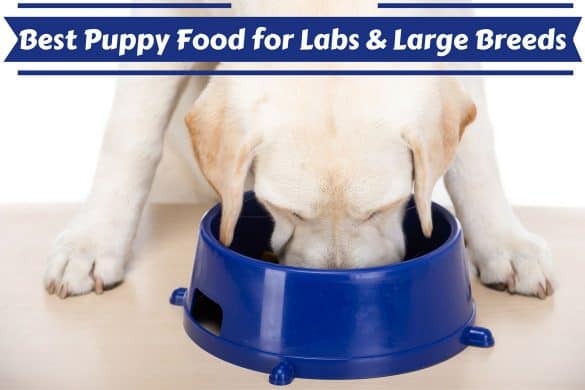 ), he won’t have any particular expectations, and won’t automatically connect food with good behavior. It also saves you the necessity of carrying dog treats on your person at all times! Now that we’ve looked at how to stop your dog from jumping on you, we need to figure how to keep him down off visitors to your home. Strangers can be almost as exciting as owners to a dog, partly because they often greet dogs with extra gusto. How, then, do you get your dog to behave as well for others as he does for you?  The first step will be behavior modification – for your visitors! When you’re in the process of training your dog to stay down when saying hello, let your friends and family know what you’re up to. Ask them to please help out by not encouraging the bad behavior through their own actions; have them greet your dog calmly, and ask them to refrain from giving the dog attention if he is having a hard time staying down. Of course not everyone who comes to your door can be prepped in advance, and there are strangers on the street to contend with too. So you will have to teach your dog how to act in these circumstances. If you have some good friends or family that are willing to help out, you can have them take your place using the same techniques I’ve outlined above. When your dog has the same behavior reinforced by multiple people, they will learn that this behavior is the right choice when greeting anyone, and not just you. You might find it useful to perform this training with your dog on a leash, even if you’re in the house. Using a leash with a harness is an effective way to hinder your dog’s ability to jump up and encourage them to keep ‘four on the floor.’ A collar isn’t recommended for this kind of training, as it can be very hard on your dog’s neck. Another method you might try with a friend involves a longer approach and is useful for learning how to greet in situations other than at a door. With your dog on a leash, have a friend (and make sure this friend is someone your dog actually wants to greet!) stand a short distance from your dog, maybe 10-15 feet. Ask your dog to sit, and praise him when he does. Once your dog is sitting, your friend can begin to approach him. If the dog gets up to move towards your friend, have your friend turn around and walk back the way they came. Give the command to sit again. When your dog sits, your friend can approach once more. Repeat this process a few times, and soon your dog will figure out that if he wants to say hello to this person, he’s going to have to sit and wait for them. Strangers you meet in public present a unique challenge while training your dog not to jump. Don’t be afraid to let a stranger know that you’re working with your dog to correct this behavior and could they please not pet your dog if it jumps. Some people recommend having the stranger offer the dog a treat as a reward for not jumping, but I would be hesitant to teach a dog that everyone who approaches him is a potential source of treats. Anyone who has helped a dog to learn the difference between acceptable and unacceptable behaviors knows that it’s seldom a linear process. There will be progress and regression before the ultimate goal is reached, and your dog will go through what are known as ‘behavior extinction bursts’ – quite simply, things may get worse before they get better. If you see this happening, don’t give up! It’s a natural part of the process, and if you throw in the towel now, you’ll be cementing the bad behavior in place. Now that we’ve covered some good ways to stop your puppy from jumping, it’s important to go over some behaviors for YOU to avoid as you work towards owning a non-ballistic dog. Much like when you’re trying to teach your dog not to bark in certain situations, yelling at your dog and getting generally loud and animated won’t help. Most likely your dog will think you’re joining in the fun, which will encourage him to jump even more. A calm approach is always best. There are those who suggest that bringing up your knee to meet the dog’s chest is an effective way to discourage jumping, but this is not recommended. Standing on one foot puts you off-balance and could cause you to fall over. Also, you run the risk of injuring your dog with a sharp knee to the ribcage, which may make them afraid to approach you. Clearly not the end result you’re looking for! In fact, any sort of physical approach to the problem is likely to backfire in some way. Shoving your dog, or grabbing it by the paws or legs will probably be seen as play, and there’s not much a Lab loves more than to play! 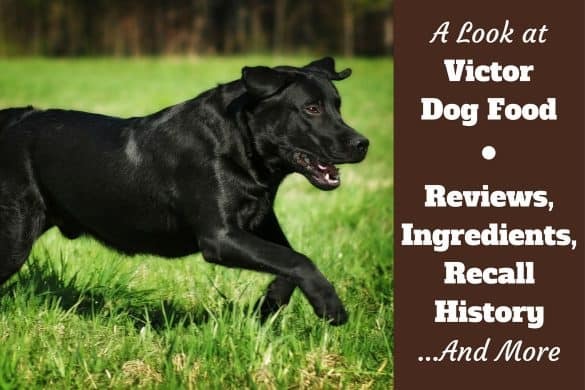 Stick with verbal commands, treats, and praise. 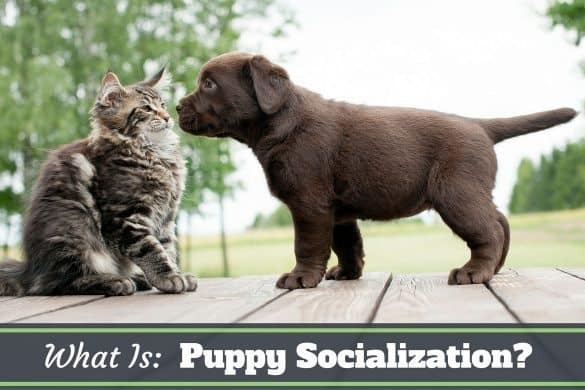 There’s a school of thought that suggests crating your dog when guests come over gives the dog time to calm down before coming out to socialize. My personal experience is that my dog now has time to get REALLY wound up and then he bursts out like the Tazmanian Devil in a Bugs Bunny cartoon! Crating the dog does not directly address the problem behavior, and may seem more like a punishment. If your dog is aggressive towards outsiders in your home, then crating may be necessary while you work on that issue, perhaps with a professional trainer. Everyone wants to have the perfect, well-mannered dog that’s always calm and polite (but happy!) when people stop to say hello. The truth is, while elusive, that very dog is living inside your dog right now! It’s up to you to let him out. It will take time, it will take work, and it will most definitely take patience. But it will all be worth it in the end. Learn to enjoy your personal welcoming committee, and stop fearing the friskiness! Thank-you, I really appreciate this article, and found it to be very helpful.